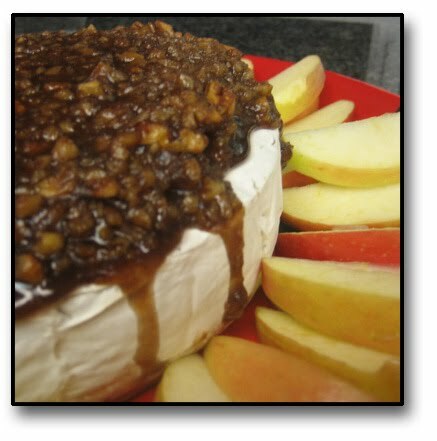 This has to be one of the most versatile and popular appetizers around....Holiday Baked Brie. It's so easy and simple to make, yet so delicious that even children like it! I've even prepared it and given it as Christmas gifts to my managers and co-workers, and it was such a hit that I received requests, not only for the recipe but to gift it again the following year! Place brie wheel in a baking dish which will also be the serving dish. I use a nice ceramic pie pan. Generously pat brown sugar on top of brie wheel so that it’s about 1/2 - 3/4 inches thick. Sprinkle pecans over the top, slightly pressing them into the brown sugar to keep them in place. Completely cover pecans and brown sugar with pats of butter all over. Bake at 400° until pecans are brown, sugar is melted and bubbly, about 15 minutes. Serve warm with apple and pear slices, and assorted crackers. I don't suppose you have any of the calorie info on this? (I have to record my diet in a food diary...and I know this isn't healthy, but it looks SO good) haha...!